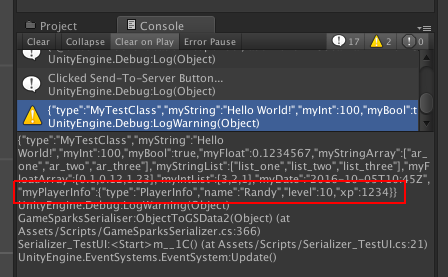 The serialization code covered in this tutorial will allow you to send objects containing most data-types to the server by serializing them directly into a form GameSparks can understand. This is recommended when you want to save game-states (for example) to GameSparks and to the client locally. Using a serializer, you can save the same game-state object to disk and to GameSparks, synchronizing the data without having to parse out individual fields and sending them to the server. 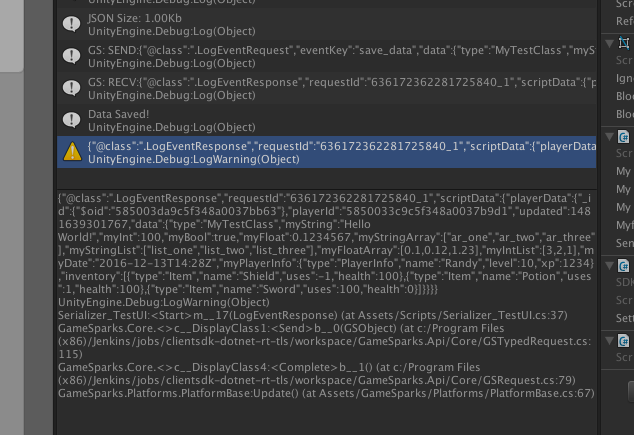 Simply give the object you want to send to the method and it will create a GSRequestData object from this which can be sent to GameSparks. This tutorial will cover the basics of how to achieve this but there are types excluded which may require you to develop the serializer further - if you want to add dictionaries for example. There's also no code for serializing primitives directly because the GameSparks SDK already offers GSRequestData for most data-primitives, so we'd advise you to use that instead. The basis for this tutorial is the GameSparksSerializer.cs class. This class will be broken down into two main methods: GSDataToObject and ObjectToGSData. 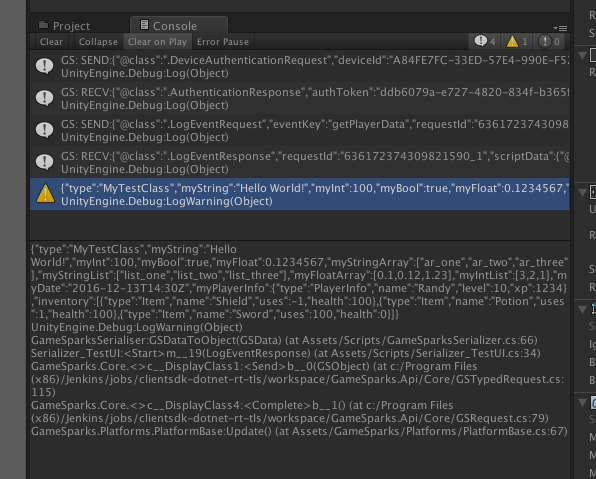 To begin with, create a new C# class called GameSparksSerializer.cs. The ObjectToGSData method will take a C# object and, using reflection, we'll check what fields exist in that object. 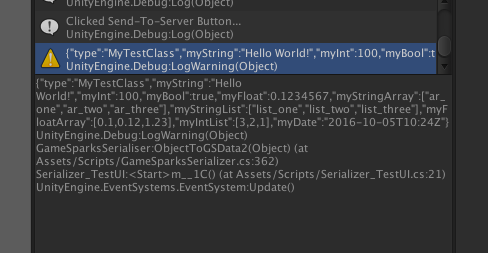 It will also check if those fields are serializable, allowing you to mark certain fields in your objects to be sent to GameSparks or not. Using reflection allows us to gain information about the Object without needing to know which specific fields exist or having to create separate methods for separate object-types. We'll be converting the information into JSON, so we're going to use field-names as keys for our JSON data. We'll also need to store the object type as a separate field so we can create an object out of our JSON data when we want to get the object back. We start with this method, because we need to have some data stored correctly on the server before we can retrieve it and convert it back into an object. Our object will be stored in a collection on the server as JSON data. We need to create a method to retrieve this data and parse it back into the original form. We'll therefore be passing GSData from the server response into the GSDataToObject method. Reflection is the ability of a program to inspect its own meta-data at runtime. You could think of this as dynamic code generation at runtime. Instead of hard-coding all the class types we expect to serialize, we can use reflection to instantiate types at runtime based on what the compiler understands about those classes, types, and the fields they contain. Reflection is quite a broad area of C#, and we're only covering a small portion of it in this tutorial, so we would advise looking into it further if you wish. There is a good explanation of reflection available here. The main class we'll be using in this tutorial is System.Reflection.FieldInfo. This class allows us to inspect information about fields in our classes. Using this, we can extract only the information we need to serialize for any object we want to send to the server. Note: There are some limitations for reflection with iOS, though we'll not encounter those limitations in this tutorial. But it's still important to know this if you want to develop this serializer further. There are some notes on this issue here. Create a new method called ObjectToGSData. We'll make this a static method because there's nothing else that relies on an instance for this method to run. The return type of this method will be GSRequestData. 1. First we create a new GSRequestData object to which we'll add fields and return from this method. 2. For each value we add, we include a new field called type. This will be the type of the object we are converting to GSData (we'll use this later to parse the field back to the correct type). 3. We then iterate through every field we find for that type using the System.Reflection.FieldInfo class. This class gives us many details about the object’s fields. These will be explained as we go through the tutorial. 1. Check the field is serializable. We want the serialize to ignore fields marked as not serializable. We can do this very easily with the FieldInfo class. Using the field we can get the type of that field and then use field.IsNotSerialized. 2. Check that the value for that field is not null. In other words, just because the class has a field defined doesn't mean that there is any data for the field. In this case, there's no point sending that field to the server, so we exclude it from the serializer. We can do this using field.GetValue(). This method takes an object, in this case the object we are serializing. // everything in here can be serialized! The next thing we want to do is actually serialize some data. So we need some data we can easily serialize. GSRequestData can convert some simple types to GSData, so we'll look at those first. The AddString() method takes the object you want to serialize and a key used to define it. In this case we used the name of the field as the key. This is important because using the field-name allows us to search back through fields when we are parsing back into an object. Now pass this object into the ObjectToGSData() method we just created to see what gets serialized. If you run this code, you will see the JSON printed out in the warning log we created at the end of that method (the warning log is just to make it stand out from other logs in this case). 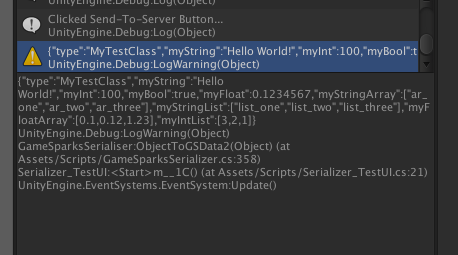 And now, if we try to serialize our test-class again, we should see all our variables listed as JSON. For those not familiar with serialization in C#, there are some ways to set classes and fields as serializable or non-serializable. This is important, because there's usually some fields in your class that you want to send to the server and some you do not. There will also be some fields that are not serializable at all using this tutorial, though you can always add those yourself (this will just cover serializing the basics). 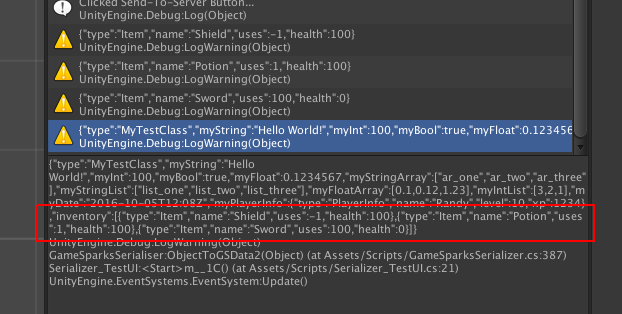 In Unity3D, for example, classes like Button or GameObject could have triggers or event-listeners you do not want to send to the server. One way to stop fields from being serialized is to set them as private. The other is to mark them with the NonSerialized attribute. The GSRequestData class has the ability to create JSON data from two types of lists or arrays out-of-the-box. These can be lists of numbers (float, int, double) or lists of strings. From the point of view of GSRequestData, it only accepts lists, so any arrays we want to send will have to be converted first. The first thing we need to do is check that the field type is an array of strings. Then we will use the GSRequestData.AddStringList() method. 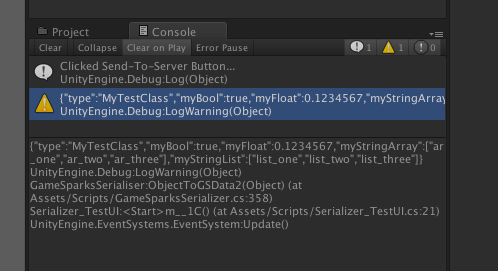 As mentioned, this only accepts a list of objects, so we'll convert our array to a string-list. You can see from the code above that the conditional statement checks if we have a list first and, if so, we add it as a list. Otherwise, we create a new list from the value of that field (the array). In our test-class we'll need to create an array of strings and a list of strings so we can prove that both serialize properly. These work the same way as the string example above, only we use the AddNumber() method. Again, this only accepts lists, so we will have to convert any arrays before we pass them to AddNumber(). You can also add some functionality to parse doubles or longs here, but for this example we'll only deal with floats and ints. Serializing basic-types or lists of basic-types is easy using GSRequestData, but what if we want to serialize an object contained within the object we want to serialize? Then we need to add this object to our test-class. We won’t review an example of this code, because these examples will begin to take up a lot of space. All we're doing is creating a new field and then instantiating the field in the test-class constructor. 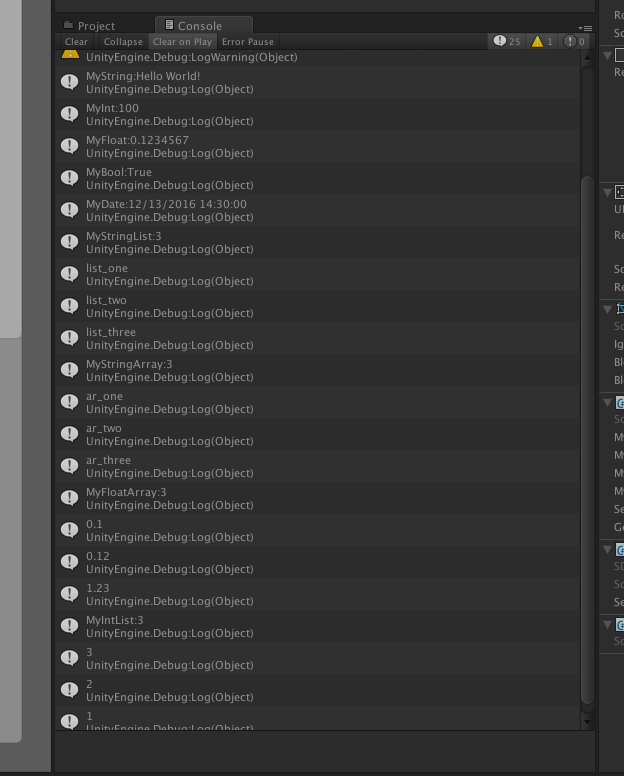 Now we have almost everything we need to get the basics of a data-serializer working with the GameSparks SDK. The last type we are going to look at in this example is lists or arrays of objects. Back in our serializer code, we're again going to check that we have the correct type. The first thing we need to do is check if we have a generic type. This is because technically our list can be interpreted as a class with the way we have our code written. So we'll first use FieldType.IsGenericType to make sure our class serializer is checking for a class or list. Within this if-statement we'll create a new list of GSData. This is going to be added to our main gsData variable as an object-list (we’ll see this in the JSON data later). Then we'll iterate through object-list and add new GSData objects for each element in the list using ObjectToGSData() again, as we did when we were saving nested objects. Lastly, we should add some code to allow arrays to be serialized as well. Since we use the IList, we don’t have to do anything special with arrays, because IList will have them the same once we cast them. Something that might be useful is to know what your size your JSON data is before sending it to the server. NOTE 1: Although this process for saving data to the server is easier, you should also keep in mind the amount of data you are sending to the server. GameSparks limits the size of data that can be send through a request (<256Kb). NOTE 2. Also keep in mind that although you may not reach this limit, a large amount of data will have a significant effect on the speed of requests and responses. We'll use collection.findAndModify() to search for a player’s ID and then insert the new data. Note! We have a line at the end to return the doc we are saving. This is just for this tutorial, you can remove it later if you like. All it does is to prove the doc was saved correctly for us by returning it back. 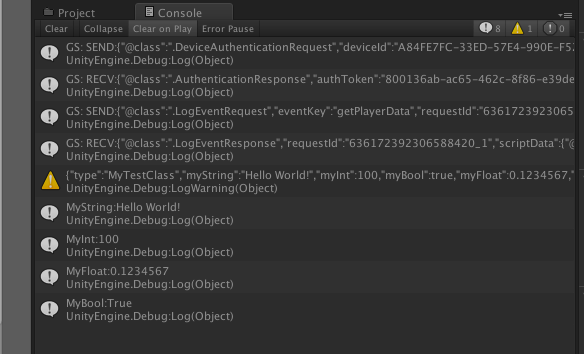 Now we just need to put some code in to send our GSData to GameSparks using the log-event we just created. All we need to do is find the document in the collection for this player, and return it. Now we need to create the GSDataToObject method. Again, this will be a static method, returning an object and taking GSData. 1. Parse the type field for this object into a Type. 2. Create an object of that type (this is what is returned from the method). 3. Go through all fields for this object-type and find the matching field-names in our GSData. 4. Convert the GSData to an object using the Get functions. The first step will be to get the type. This is pretty simple, because we can create a type from a string and we stored the type of each object in a JSON field. The next step will be to use the Activator class to create an instance of an object from that type. We'll start with a few basic types to test how this works. The logic works the same as with ObjectToGSData. We just check the field-type and then use the appropriate method. In this case we use GSData.GetNumber(), GetString, and so on. Testing that the data has been de-serialized requires us to add a method to our MyTestClass class. We're calling this method Print(), and we're going to call it just after we cast the object from GSDataToObject() back into MyTestClass. If the value did not de-serialize properly for some reason, we can expect that value to be null and so we should get a null-reference error. And there it is! We have our first few primitive types back from the server after converting them to JSON. From here, you should be able to figure the rest of the process out by yourself, but we'll go through the next few steps anyway. In the image above, all we did to the Print() method was print out the count or length of the array or list to check it was correct. To be doubly-sure, we iterated through the elements and printed those out too. And this is our GameSparks serializer complete. Once again, there some types missing here that you can now add yourself, because any types will follow the same pattern as we have covered in this tutorial.